Across the world, biodiversity is being battered by familiar foes. Habitat loss, overexploitation, invasive species, and impacts of human development are leading us to what many believe may be the sixth great extinction. A northern quoll. This native marsupial 'cat' is suffering greatly in northern Australia. In contrast to the environmental pressures on other continents, large parts of Australia have undergone only limited modification, and are sparsely settled and remote. Many areas have substantial nature reserves. Yet, nonetheless, Australia has the world’s worst record for contemporary mammal extinctions. One in ten species have disappeared in the last 200 years -- and of those that persist, over a third are now threatened or near threatened. What’s more, recent analyses suggest the problem is even worse than previously thought. Greater recent recognition of Australia’s ‘extinction calamity’ and its spread to the tropical north (see here, here and here) has provoked intense interest and stimulated a series of research and management initiatives to study the declines, their causes, and what can be done to halt them. A new paper I published with a team of coauthors summarizes the research efforts, and assesses the effectiveness of recent conservation-management interventions. In our view, the loss of Australia’s mammals has been driven primarily by what has been dubbed Australia’s Ecological Axis of Evil -- an unholy trinity comprising the feral cat, altered fire regimes, and grazing impacts. Alone, these threats do not explain the declines but there is now some compelling evidence that, when operating in concert, predation by feral cats exacerbated by frequent, intense fires, reduced ground cover from overgrazing, and, in some areas, the control of dingoes are driving the declines. So what’s to be done? The demonstration of interacting factors gives conservation managers some options for reducing their impacts. There are now some examples of rapid recovery of species following threat management. Priority actions include intensively managing fires, reducing feral livestock in conservation reserves, establishing exclosures to keep feral predators out, enhancing biosecurity for important islands where rare species still persist, and acquiring grazing lands in important mammal areas for conservation purposes. Despite some progress, we still have much to learn and even more to do, to stop and reverse the devastating declines. Equally worrying is that Australia's federal and state governments are planning an ambitious expansion of agriculture, grazing, roads, energy, and irrigation projects in northern Australia. These developments are likely to intensify threats that have so far been limited in the region, but that have caused much biodiversity loss in other parts of the world. This is a dangerous time for Australia's biodiversity. Without effective planning and management actions, a significant component of northern Australia’s mammal fauna could collapse -- contributing further to the continent’s already-woeful record for mammal extinctions. Are Australia's mysterious mammal declines spreading? ALERT has previously reported on the enigmatic and alarming population declines of mammal species across northern Australia. Now, it appears the declines could be even more widespread than previously suspected. To date, the declines of smaller and medium-sized mammals, such as quolls, bandicoots, and native rodents, have been mainly documented in monsoonal forests and woodlands across Australia's top end -- such as those at Kakadu National Park, where the declines have been best studied. Additional research -- including interviews of Aboriginal communities in remote areas of northern Australia -- have shown the declines to be widespread in nature, extending over many thousands of kilometers. Now, recent research -- which has yet to be published -- suggests that the declines might even extend to northeastern Australia, to the wet tropical region of far north Queensland. In this area, live-trapping and camera-trap studies by Sandra Abell-Davis of James Cook University suggest that the tropical bettong, an endangered wallaby-like marsupial, may also be declining sharply. Abell-Davis studied three areas that had formerly been live-trapped for the bettongs, using identical trapping methods. She found that, on average, bettong numbers had fallen by more than 80%. Abell-Davis emphasizes that her findings, while alarming, are still provisional. She wants to trap more extensively for the bettong and use novel genetic analyses, to see if its numbers have fallen elsewhere in the region. In fact, she is looking for volunteers to help with this important field work. 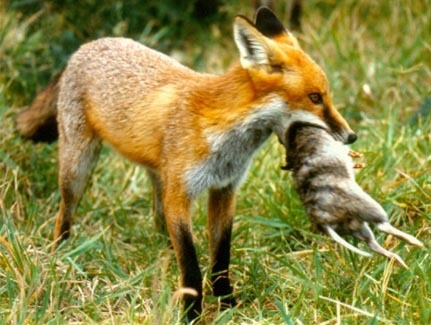 A number of possible drivers have been suggested for northern Australia's mammal declines, with feral cats and altered fire regimes being among the leading suspects. Other suggested possibilities include foreign pathogens, changing rainfall regimes, overgrazing, foxes, and the introduced cane toad, which produces toxins deadly enough to kill virtually anything that eats it. Whatever is going on, it raises frightening prospects for an Australian continent that has already suffered massive extinctions of its native mammals. Across the top end of Australia, from Cape York to the Kimberly Mountains, populations of smaller marsupials and native rodents are collapsing. What's going on? Several studies in recent years have documented the declines. A few have shown major changes in a single location, such as Kakadu National Park. Others have compiled scattered information over a much broader area; one innovative study used interviews with Aboriginal communities to piece together evidence (find study here). The bottom line: many species that used to be common have become vanishingly rare, or have geographic ranges that are collapsing. What is causing all this? No one is sure. Some suspect it could be severe overgrazing by livestock, especially during droughts. During such times the vegetation can become badly damaged--as we're seeing at present in many areas. Others think altered fire regimes are the cause. And yet others suspect predation by feral cats, with a possible role for lethal cane toads for certain predatory mammals. Whatever the cause, this might be a new biodiversity crisis for the Land Down Under, which has already lost more native mammal species than any other continent.